Represents a declaration of a type. Definition at line 2873 of file Decl.h. Definition at line 2888 of file Decl.h. Definition at line 2910 of file Decl.h. Definition at line 2911 of file Decl.h. Definition at line 2900 of file Decl.h. Referenced by CheckObjCBridgeCFCast(), CheckObjCBridgeNSCast(), clang::Sema::checkObjCBridgeRelatedComponents(), clang::Sema::CheckObjCBridgeRelatedConversions(), dllExportImportClassTemplateSpecialization(), clang::TemplateDeclInstantiator::InstantiateClassTemplatePartialSpecialization(), clang::TemplateDeclInstantiator::InstantiateEnumDefinition(), clang::TemplateDeclInstantiator::InstantiateTypedefNameDecl(), rewriteToNSEnumDecl(), rewriteToNSMacroDecl(), clang::Sema::tryCaptureVariable(), UseNSOptionsMacro(), clang::ASTNodeImporter::VisitClassTemplateSpecializationDecl(), clang::TemplateDeclInstantiator::VisitCXXMethodDecl(), clang::ASTNodeImporter::VisitTemplateTypeParmDecl(), and clang::ASTDeclWriter::VisitTypeDecl(). 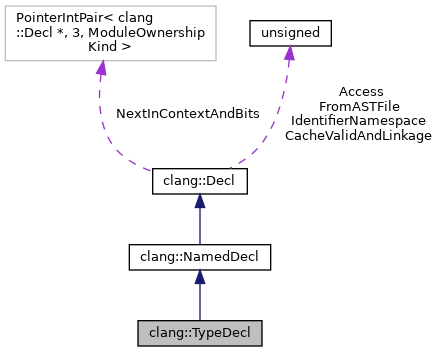 Reimplemented in clang::TagDecl, clang::TypeAliasDecl, clang::TypedefDecl, clang::ClassTemplateSpecializationDecl, clang::TemplateTypeParmDecl, and clang::ObjCTypeParamDecl. Definition at line 2902 of file Decl.h. Definition at line 2897 of file Decl.h. Referenced by clang::CodeGen::CodeGenModule::AddVTableTypeMetadata(), clang::Sema::BuildDelegatingInitializer(), clang::Sema::BuildObjCTypeParamType(), canPassInRegisters(), clang::TypeName::createNestedNameSpecifier(), decomposeTypeForEH(), clang::Sema::DiagnoseUnusedNestedTypedefs(), clang::CodeGen::CGCXXABI::EmitMemberFunctionPointer(), clang::CodeGen::CodeGenFunction::EmitTypeMetadataCodeForVCall(), clang::CodeGen::CodeGenFunction::EmitVTablePtrCheck(), clang::CodeGen::CodeGenFunction::EmitVTableTypeCheckedLoad(), clang::ento::SValBuilder::getCXXThis(), GetDeclSpecTypeForDeclarator(), clang::getParameterABISpelling(), clang::ComparisonCategoryInfo::getType(), hasDefaultSetterName(), clang::TagDecl::setTypedefNameForAnonDecl(), clang::TemplateDeclInstantiator::VisitCXXMethodDecl(), and clang::ASTDeclWriter::VisitTypeDecl(). Definition at line 2901 of file Decl.h. Referenced by clang::Sema::InstantiateClass(), and clang::ASTDeclReader::VisitTypeDecl(). Definition at line 2898 of file Decl.h. Definition at line 2874 of file Decl.h.